It's Fitness Friday and I'm linking to Sandy from God Speaks Today. You may remember that last week Sandy attended SheSpeaks Conference with her book manuscript in hand. If you missed that post and want to catch up, you can read about it here. She's still waiting for word but had great interest from editors and publishers. So, keep the prayers coming for Sandy. Today, I'm going to share a recipe that's perfect for hot summer days. Now living in Phoenix, I could probably eat this one all year round. LOL. I always try to keep a batch of Ina Garten's Gazpacho in my refrigerator during the summer. It stays for a good while and you eat it cold. I often prepare it once a week. 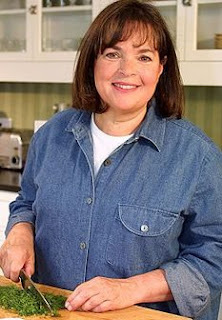 Ina is the Barefoot Contessa and is the BEST cook on the Food Network, in my opinion. Did I tell you that I visited her shop in East Hampton years ago when it was still open? Let me just say, you don't want to go there if you're watching your weight. East Hampton is ...another one of my favorite places to be. Do you remember that I love the ocean and yet live in the desert? You can read about that here. But I also love mountains and ...Phoenix has plenty of those. Another reason I love East Hampton is that some of my favorite people live there. Now, I'm not talking about the rich and famous who summer there. But Michael, who is one of my godchildren lives there with his wife and little girl and so does his brother Christopher. They're both grown up but I held them in my arms when they were babies being christened. OK, I think I'm starting to adopt the Sandy style of writing. Love you Sandy! Now to the fabulous summer recipe to make ... gazpacho. Ina Garten is not known as a low fat, healthy cook. Her recipes are amazingly good but she tends to use lots of real butter, sugar and all those ingredients that I love ...but make me fat. BUT thank you Ina for a recipe that I can share as a healthy low calorie one; your fabulous Gazpacho. Roughly chop the cucumbers, bell peppers, tomatoes, and red onions into 1-inch cubes. Put each vegetable separately into a food processor fitted with a steel blade and pulse until it is coursely chopped. Do not overprocess! After each vegetable is processed, combine them in a large bowl and add the garlic, tomato juice, vinegar, olive oil, salt and pepper. Mix well and chill before serving. The longer gazpacho sits, the more the flavors develop. This is a soup I always keep on hand during the summer. Since it's only my husband and me, I half the recipe and usually add less of the olive oil. And it still tastes great. OK guys, go and make that gazpacho and ...you'll be glad you did. Now don't forget to visit Sandy. She has a post on free and cheap ways to exercise. So, there's absolutely no excuses to not exercise and eat healthy. Caring for our bodies properly is not about being vain. It's remembering that we are the temple of the Holy Spirit. And we want to have the energy to do what He's called us to do, right? Oh... it's a soup? I thought it was salsa...lol. Oops. Very interesting, I'd love to try it but I'm a little pregnant at the moment...lol. The last two times in pregnancy I ate something like this I went into labour the next day...lol. But I'm certainly going to keep this - apparently babies love garlic in their mother's milk...lol. Thank you so much for stopping by my blog!! I love having new bloggy friends. How fun what you shared about Barefoot Contessa...I SO enjoy her show, and I love her recipes. Thanks for the good recipe. "Caring for our bodies properly is not about being vain. It's remembering that we are the temple of the Holy Spirit. And we want to have the energy to do what He's called us to do, right?" Sounds like a good recipe. I need to get back on track with my health goals. I needed this post earlier today - eat healthy and exercise! I did the first, not the second. Thanks for the reminder! Hey, I came over from Edie's blog! Great recipes and info here! Oh Debbie! Girl, I LOVE the new look! I've been so busy this past week, then went out of town ... haven't been by here. I love it! I just grabbed your button! This sounds great! I'm going to have to give it a try! Thanks for sharing. I am going to be here every Friday morning waiting for encouragment. Today, I am going to Women's Wellness for a year long Heart Study for women. Six years of abuse to by body is finally taking its toll. You will be a great motivator for me.